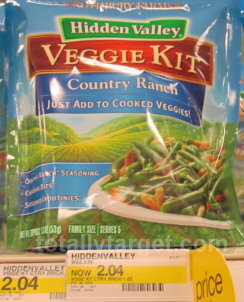 Hidden Valley Veggie Kits as low as $1.04! Print out this $1/1 any Hidden Valley Veggie Kit coupon and bring it to Target to score this good deal. = as low as $1.04 each after coupon! NOTE: The regular price on these are $2.54, but some flavors are on sale for $2.04! Sale prices may vary at your store though.